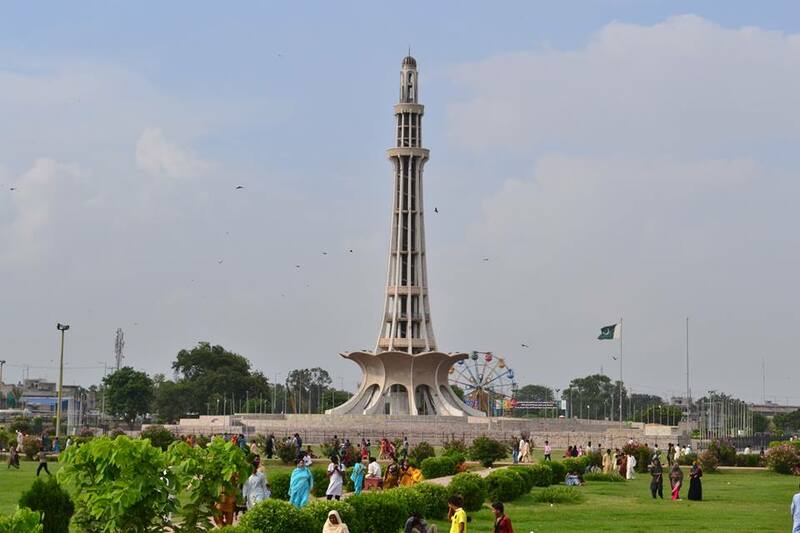 Minar-e-Pakistan (literally, Tower of Pakistan), a monument built to commemorate the day when Pakistan Resolution was passed in March 23, 1940. This resolution was the first official call for a separate & independent homeland for the Muslims living in South Asian subcontinent based on Two Nation Theory i.e. Muslims and Hindus are two different nations. 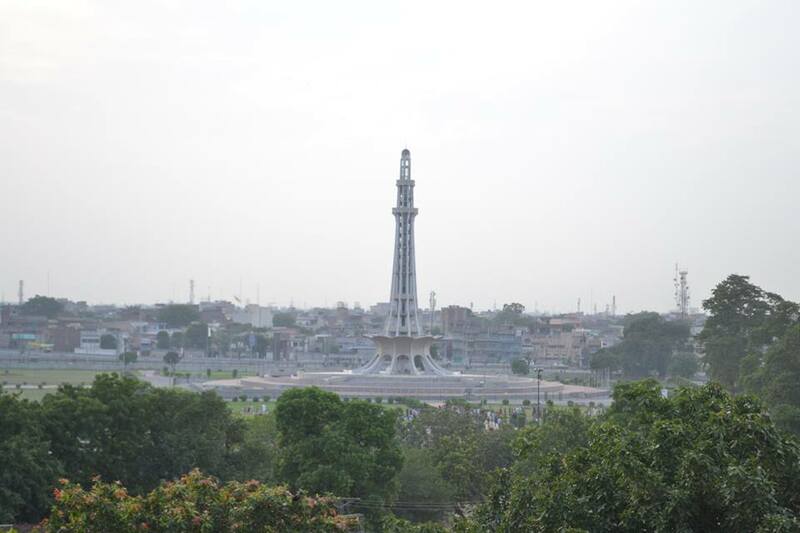 Minar-e-Pakistan is located in Iqbal park near Shahiq Qila (Lahore Fort) and Badshahi Mosque. Since visited all these places on same day, so I had little time to spare for Minar-e-Pakistan. I just took some photos of this tower from outside of Iqbal park. Minar-e-Pakistan’s base elevation is 8m from ground whereas tower itself is 62m tall, totaling 70m from ground. I took this picture from balcony of Shahi Qila (Lahore Fort). This tower also has an elevator as well as spiral stairs to reach top. Due to shortage of time, I couldn’t manage to have a panoramic view of Lahore city from this Minar. 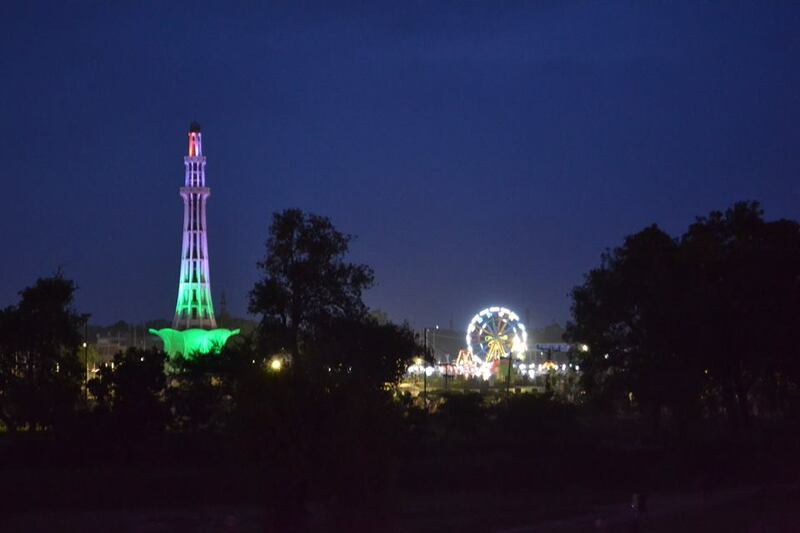 The National Tower of Pakistan in evening with a merry-go-round in Iqbal park. Though a bit off to subject of this post but I often think about scenario of two neighbours where one worships a cow, consider it a goddess and sprinkle its urine over himself and around his home for blessings whereas the other person, living next door, slaughters a cow for celebrations and enjoy BBQ party with its meat. Just two opposite extremes. In my opinion, it’s high likely for anyone of them to be intolerant for the other. I feel really thankful to Allah for living in an independent Islamic country when I see others fighting for their freedom or for their survival around different parts of the world. Just to mention that Muslims are more in numbers in India compared to Pakistan yet they make a small percentage around 14% of total Indian population whereas Muslims contribute to 97% of Pakistani population. Assalamu Alaikum bro. Here you have really posted beautiful pictures of Pakistan. I’m so glad that I got to see our ancient monuments which exist in your country. Offcourse India is not a Muslim nation but believe me it’s not at all difficult to live here. People give full respect to our religion even some keep roza just because of the curiosity. If we really deduct politicians then India is quite safe for Muslims. I believe Politics is a prob everywhere and every country has its positive and negative sides. As a Muslim it’s our duty to not to harm any other religion. So being a good ummah we have to ensure that wherever we are staying people do feel safe with us. We should not lie or do cheating with any state. So in short it’s not the Quantity which matters it’s the Quality of Ummah which is gonna make difference in this world and hereafter. It’s good to know that Muslims in India are satisfied. I wish more for all of us. I have been here in saudia arabia for last few years and i have many indian friends, both muslim and hindu. During our discussions, they told me that they have less job opportunities in govt sector and in army as well. Education is almost ok. Some indian states are more problematic and ban on cow meat or slaughter on eid. Anyways, I wish and pray to Allah for well well being of whole ummah. Stay blessed.